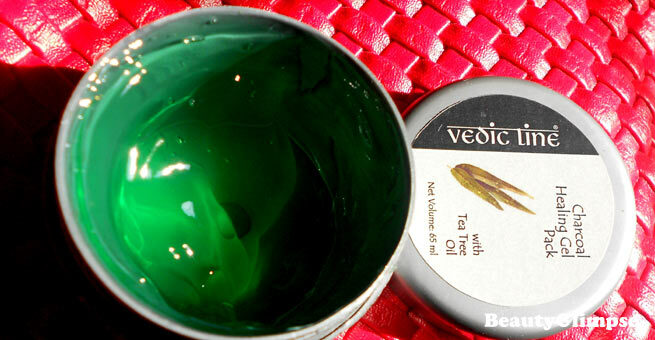 Vedic line is a brand that has gained popularity off late and its line of products so far is excellent. Most of the products from Vedic line have been reviewed online and after trying a couple of them I was too convinced about their products. 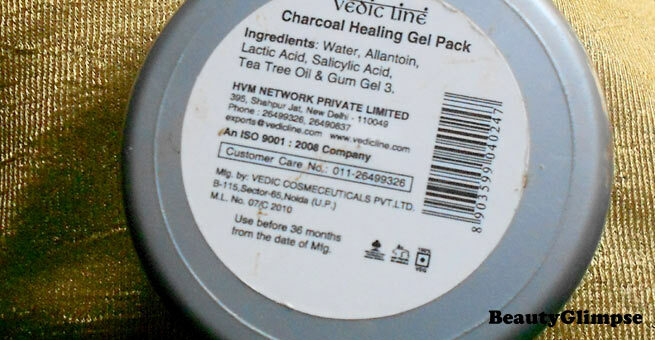 Today I am reviewing one product that I loved in particular and that is Vedic line Charcoal Healing Gel pack with tea tree oil. 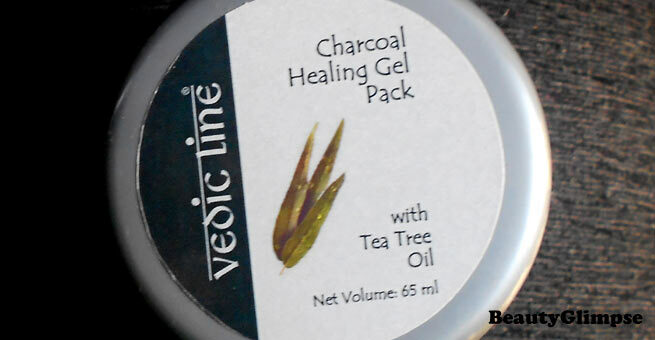 Vedic line charcoal healing gel pack as name suggests is a gel pack with tea tree oil. The pack being gel and of course with tea tree oil says this one is best for oily skin. The pack leaves a gentle dewy feeling. It removes impurities, absorbs toxins. Soothes as well as comforts skin. Ingredients: Water, Allantoin, Lactic acid, Salicylic acid, Tea tree oil and gum gel 3. Direction to use: Apply it on the moist skin. After 10 to 15 minutes, spray a toner and wipe it off. Packaging: The gel pack comes in a grey and black packaging. The pack comes in the form of a green clear gel. The gel pack is green coloured, clear and needless to say, of gel consistency. The gel has a mild fragrance of tea tree oil. The gel has to be applied on a clean moist face. When applied it gives a calming effect, thanks to the coolness that the gel provides. Since it is a gel pack it does not dry like the regular packs, hence no worries about wrinkle formation and stuff. The pack spreads very well on the skin therefore a little amount is all that is required for the face and neck. After 15 minutes you can either wash your face or wipe the pack off your face. After washing I felt that my skin is soft, supple and smooth. The pack endows a glow to your skin. Overall this is a very light and very effective face pack and feels great on the skin. Post using this pack I felt that my skin is less prone to acne outbreaks too. This is a must have face pack for oily skin especially as it clears the skin and prevents pimples too. It does what it claims to, so no complaints! Yes, I will as this pack works well on my skin and gives my skin that instant glow when I need. This face pack is great for dull and acne prone skin and for all those who want an instant glow on your skin.